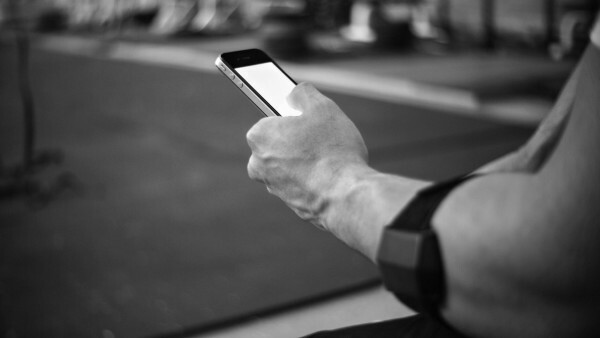 The Push Strength is a wearable bluetooth velocity based training (VBT) device that interfaces with your phone or tablet. It measures the velocity (speed) and power of various movements in the gym ranging from barbell and dumbbell movements to exercises like pull ups, dips, and even explosive movements like jump squats. 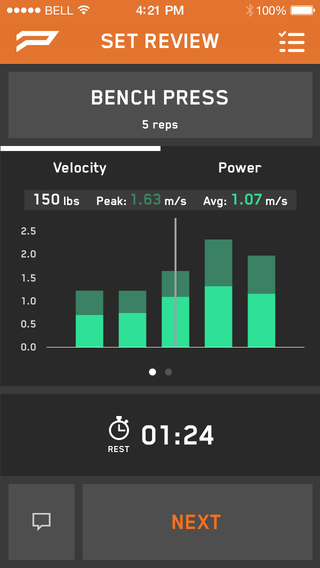 There is a free app available for both Apple and Android products that tracks both average and peak velocity/power. Prior to the Push Strength, the primary devices used to measure bar speed were the Tendo and the Gymaware, priced at around $1300 and $2300, respectively. At that price point, velocity based training was previously not something accessible to individuals. Additionally, the Tendo and Gymaware attach to the bar via a string, so they are limited to barbell movements. Essentially the Push Strength, attempts to make VBT accessible to the masses at a price of only $189 and adds functionality for movements outside of basic barbell movements. When it comes to a measurement device, there are two variables that must be considered: accuracy and precision. Accuracy refers to how closely a measurement is to a “gold standard measurement, whereas precision refers to how close a measurement will be when repeated. Ultimately, accuracy is less important so long as the device is precise since you will likely be comparing the data from the Push Strength to the Push Strength. As of writing this review, there is one peer-reviewed study assessing the accuracy of the device, although in this study they only tested the bicep curl and dumbbell shoulder press using a maximum weight of 15lbs (6.8kg) 1. The results revealed that overall the Push Strength is precise and accurate; not perfect, but certainly good enough to get the job done. I’ve gotten word from the folks over at Push Strength that there are some more studies underway, so stay tuned for further validation of this technology. I have not personally compared the Push Strength to the Tendo or Gymaware. I did however have a chance to compare the measurements to video measuring frame counts and from a quick comparison of a few sets it seems as though the Push Strength is accurate within +/- 0.02 m/s for most of the barbell movements. Overall the precision is good, but certainly not perfect as it was clear that some readings were given in error. Fortunately on one of those occasions I contacted the company and they were able to make a few adjustments to the algorithm to resolve it. I’ve also noticed a significant decrease in reliability when the battery life gets low, so I try and charge it after every 5-6 hours of use as the battery life is rated at 7 hours. As a powerlifter myself I’ve had a chance to use the Push Strength on most basic barbell movements as well as exercises such as dips and pull ups. Overall I’ve been very happy with performance of this device with one glaring exception: the deadlift. The Push Strength is nearly useless for the deadlift, and it’s very unfortunate because the company does not disclaim this information on their website. The issue with the deadlift is the signal from the device gets distorted when the bar vibrates on the ground causing it to either miscount the repetitions, or give crazy numbers for the velocity, but usually a combination of the two. The current workaround by Push is to either: a) do a controlled eccentric (lowering) portion of the movement — not advisable with anything more than a very light load or b) drop the barbell at the top of the lift and reset between each rep. This is quite unrealistic as that kind of behavior will likely get you kicked out of any commercial gym…if you train at a crossfit gym that will likely be ok, but who wants to drop every single rep? Not to mention the fact that if you compete in powerlifting, failing to return the bar to the ground under control means red lights and when it comes to training the goal is to mimic competition conditions as best as possible. The only other issue I have with the Push Strength is the lack of instant feedback to see bar speed from rep-to-rep, as opposed to waiting until completion of the set. Instant feedback can make a significant difference to ensure maximal effort is provided on each rep and thus maximize performance. 2 Fortunately the folks at Push Strength are in the process of some big software overhauls so hopefully this issue will be resolved in the coming months. Will the Push Strength bring your training to the next level? VBT can be used for multiple purposes: measuring progress, ensuring maximal bar speed, autoregulating training and estimating 1RM. The reality is that when it comes to training, the vast majority of results are seen from following sound training principles, giving 100% effort, adequate recovery and nutrition…most anything beyond that will have marginal effects. If you’re an average gym goer, VBT will not likely make a significant difference in your training or your gains. On the other hand, as an athlete, incorporating VBT into one’s training can help optimize improvements in performance 3. The nature of being a competitive athlete is always about getting the absolute most out of one’s training, even if that’s difference is only a few percent or even fractions of a percent. At only $189, the Push Strength is an affordable alternative to the Tendo or Gymaware for your weekend warriors or even athletic teams. Presently, without functionality for the deadlift and instantaneous readings I am not comfortable giving The Strength Doc seal of approval, although I’m hopeful that the R&D team over at Push Strength will be able to work out that issue in future software updates. 1. ↵ Sato, Kimitake, et al. “Validity of wireless device measuring velocity of resistance exercises.” Journal of Trainology 4.1 (2015): 15-18. 2. ↵ Randell, Aaron D., et al. “Effect of instantaneous performance feedback during 6 weeks of velocity-based resistance training on sport-specific performance tests.” The Journal of Strength & Conditioning Research 25.1 (2011): 87-93. 3. ↵ Jovanovic, M., and E. Flanagan. “Researched Applications of Velocity Based Strength Training.” Journal of Australian Strength and Conditioning 22.2 (2014): 58-69. ← How Deep Should You Squat?